First Avenue will be sending off two great assets of the team Wednesday night as Eli and Mahtaab will soon call New Zealand their home. To celebrate their time here, the 7th St Entry will feature a two-piece rock band native to Minneapolis formally known as BLOODNSTUFF. Ed Holmberg (guitar/vocals) and Dylan Gouert (drums) bring a mountain of sound that is truly hard to believe comes from a duo. Looks can be deceiving, as the output of these two creatives is an amalgmation of all things hard, fun and fast. Also coming to The Entry in support will be the local talents of Honeystick, Jermaican Jake, and other special guests. Make sure not to miss out on this diverse night of quality local music as we wish Eli and Mahtaab the best of luck in their upcoming adventures. Damien is out of his goddamn mind. This isn't a recent development, but it's an important aspect of his work that often goes ignored. In place of this key element is the idea that his music is a sober and in-depth excavation of the American landscape and rural psyche. Well, folks, I'm sorry, but it's not. Damien Jurado is every character in every Damien Jurado song. He is the gun, the purple anteater, the paper wings, the avalanche, the air show disaster, Ohio, the ghost of his best friend's wife. It is a universe unto its own, with it's own symbolism, creation myth, and liturgy. You might go as far as to call it a religion, and your religion is a character in his religion. Mind Over Mirrors is the work of American harmoniumist/electronicist Jaime Fennelly. Utilizing an Indian pedal harmonium, oscillators, tape delays, and an assortment of synthesizing processors, Fennelly bends slowly-building, repetitive melodies into massive sonic mountains. Though Fennelly now resides in Chicago, Mind Over Mirrors emerged during a three-year period from 2007-2010 while he was living on a remote island in the Salish Sea of Washington State. Since then, he has released recordings on Immune as well as Digitalis, Hands In the Dark, and Aguirre/Gift Tapes. Joining Fennelly, Haley Fohr of Circuit des Yeux deploys modest acoustic constituent materials - an Indian pedal harmonium and the human voice to produce roiling, meditative music that both simulates the swells and troughs of synthesized electronics and conjures the ceaseless rhythms of tidal surges. Daniel Bachman is a 6-string and lap guitar player from Virginia currently living in Chapel Hill, NC. From 2008 to present he’s been releasing material of almost exclusively an instrumental nature while touring everywhere from Istanbul to Los Angeles. The album Orange Co. Serenade will be coming out in the spring through Bathetic Records and is Daniel’s strongest work as a player and writer yet. Back to a minimal approach with little to no overdubs and sparse accompaniment, the album is solely about the tension and release between each song. From the most ecstatic blurry moment to the loneliest thud on the gut string it will help you explore the best and worst parts of yourself. Kathleen and the Other Three was produced by Jim Abbiss (Arctic Monkeys, Adele) and Ian Grimble (Travis, Manic Street Preachers) and recorded in London and Wales. Of the new music, front man Van McCan explains, “We’re so excited to finally release something in the U.S. With this EP we’ve tried to put songs on it that grip instantly… short but explosive, with relatable lyrics. It feels like we're starting from scratch again. No one knows us and that really excites me.” Catfish and the Bottlemen are Van McCann (vocals, guitar), Billy Bibby (lead guitar), Benji Blakeway (bass) and Bob Hall (drums). The Districts are a four-piece indie rock band from the small town of Lititz, Pennsylvania. The group formed in 2009 while members Rob Grote, Mark Larson, Connor Jacobus, and Braden Lawrence were all still in high school. The energetic rockers released their first EP, Kitchen Songs, in 2012 followed by Telephone, their debut full-length, the following year. Their mix of indie Americana and blues-inspired rock caught the attention of Mississippi's Fat Possum Records, which signed the Districts in 2013. The Districts will take over the Entry Sunday night along with New Jersey natives Pine Barons. 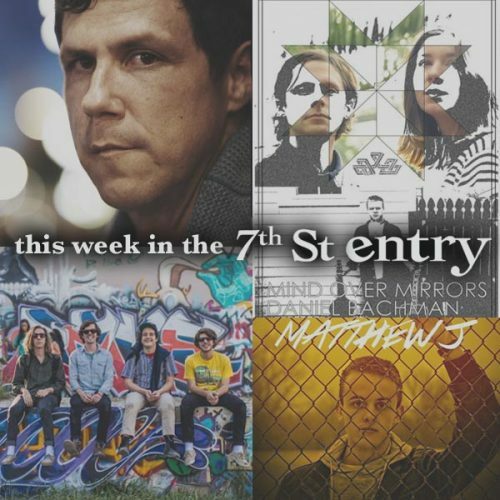 Pop artist MATTHEW J will be making his debut performance at the 7th St Entry on Monday night. Matthew spent his childhood growing up in Rabat, Morocco until he eventually found his way back to Minnesota. This local singer, songwriter, and pianist gets his style from influential greats such as The Jackson 5, The Beatles, and Bruno Mars. Supporting the act will be a number of local artists such as: Ced Linus, Sti-Lo Reel, Louie P, The Friendly Beers, J. Plaza, MWTC, Cooly, Beauty White, and Lil One.